If you look at the locations of Marazion and Penzance on a map you’ll see that they’re just a few miles apart from each other. So it’s lucky that today’s trip went via Land’s End to keep the mileage up (although it still wasn’t that many miles). At Land’s End I had the obligatory photo taken (570 miles so far. 2378 still to go, if going by my original plan). I took a different outward and return journey with only a minimal overlap, to ensure that I gather as much mapping data as possible. I did manage to make one small wrong turn though, but only realised once I’d climbed most of the hill so just adjusted accordingly. 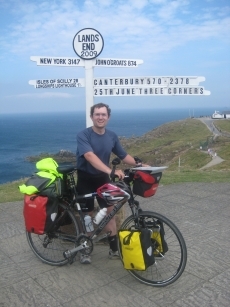 I had strong winds whilst at Land’s End and it was a headwind for the first few miles of my return journey. That calmed as I got away from the west coast though. The Internet connection at tonight’s accomodation is broken. It connects to the wireless access point fine, but doesn’t route beyond that to the Internet. So, I’m updating my blog postings via a slow mobile connection again in order to not get too far behind with them. The mobile signal strength is pretty weak though, so that’s dropping out a bit as well. This entry was posted on Thursday, June 25th, 2009 at 17:13 and is filed under Cycling. You can follow any responses to this entry through the RSS 2.0 feed. You can leave a response, or trackback from your own site.